Attorney Marketing Trendsetters Profit with Current Events Use popular news stories and current events to funnel more traffic to your website. Foster Web Marketing can help! This is your chance to get involved in your local community, build your referral base, establish yourself as an expert in the field, and attract a ton of visitors to your site. And what is the key to getting people on your site? Staying on top of what is happening in the news.What questions are people asking? Let's find out and answer those questions! Foster Web Marketing offers a few specialized forms of content blasts, designed to inject a shot of adrenaline into your website. These opportunities are crazy to pass up, and they are happening everyday. You can get traffic and links from blogs and other sites that are great for SEO, and if you have the right follow-up system in place, you can convert those new leads into business. When time matters, you need to get content and video on your site before searchers gravitate somewhere else. 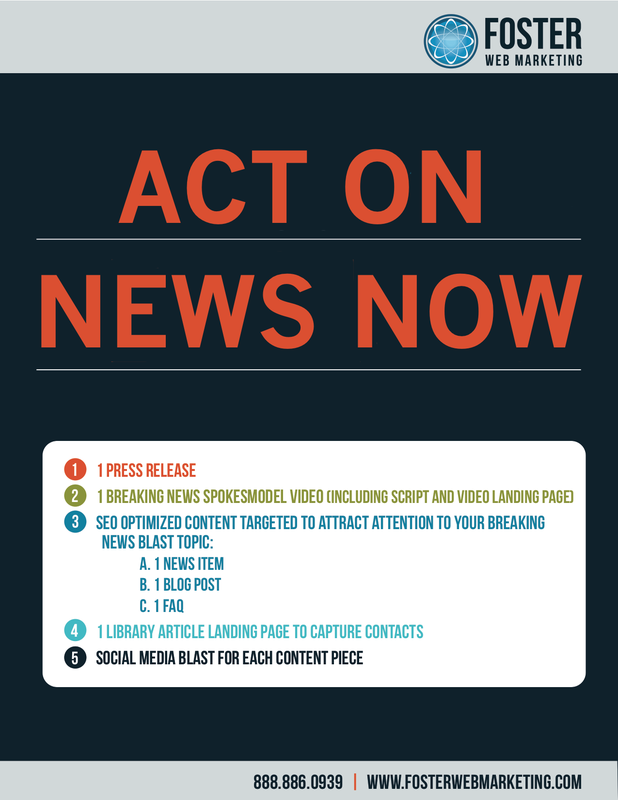 This is why we designed The Breaking News Blast Package that takes effect within just 48 hours. Not only will these pieces of content be professional and well written, they will be optimized for search engines and syndicated accordingly. Articles and blogs are great for search engines, but so is video. YouTube is the #2 search engine (yes, it's more popular than Yahoo! and Bing), which means that you need to be found there. As part of your content blast, you need to have interesting videos that answer people's questions. Foster Web Marketing will deliver your custom video clip to you within 48 hours. We'll also optimize your video for the search engines—which is the key to being found. If you want to insert yourself into the conversation, you can. Just call Foster Web Marketing at 888-886-0939, or fill out our contact form and we will get back to you within 24 hours. You can also sign up to get alerts about breaking news stories that relate to your areas of expertise by signing up for our Breaking News Alerts. Want a taste of what your Breaking News videos could look like? You can see some examples below! Heard of the class action lawsuits against Actos? This Breaking News Blast for Gray & White did what the TV commercials by larger firms could not: get cases. The needs of injured workers are often immediate. When a pipeline exploded in the Gulf VB Attorneys got in front of their prospects first with this video. With one video Damian Mallard helped get justice for a victim of abuse right after the Penn State scandal.